Below are some of the activities we offer and at the bottom of the page there are some sample programs. Most commonly associated with increasing muscle mass and strength as well as toning and defining muscles. 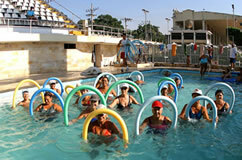 If used in a circuit method, it can be a sufficient aerobic activity. One of the more simple and pleasurable forms of exercise with safety and eficiency. It gaurantees a a high percentage of caloric burn and protecion of the joints from impact. These are simple alternatives that can bring great aerobic benefits if practiced along with the accompaniment of a heart rate monitor. Core Training is a concept which concentrates on the abdominal muscles working together with other muscles in a single exercise. The stability ball improves strength, balance, and flexibility. Swimming is also known as a “complete sport”, through which one can considerably improve cardio-vascular endurance and muscle tone. One of the most efficient forms of cardio-vascular exercise, jumping 10 minutes at a moderate pace can be the equivalent of running for 30 minutes. It is an excellent tool for developing speed, quickness, agility, and rhythm. Highly recommended for all athletes. An essential activity for people of all ages because it improves posture, lengthens muscles and increases joint flexibility. It also helps to prevent injury. 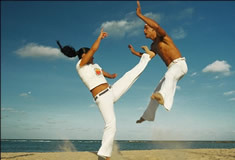 Martial Arts training improves strength, flexibility, and rhythm. It can be an excellent alternative to conventional training. 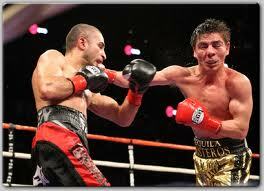 Boxing improves cardiovascular endurance, upper and lower body strength, coordination, and develops rhythm.